The add on tee enables a structure to be extended, avoiding the need for dismantling. please contact the office before ordering this product as it could be subject to extra carriage. 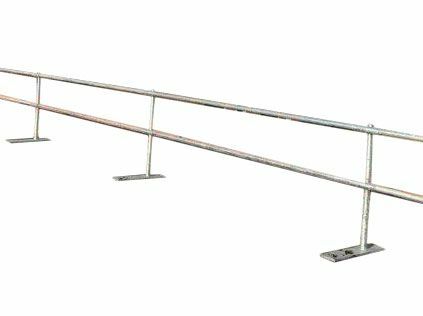 Our standard guardrail system is our most cost-effective edge protection system, and is suitable for the majority of buildings. Its simple design means that it is easy to install, and the rail’s flat rubber feet ensure that it will not obstruct the path of roof users, and poses little or no trip hazard. Our folding edge protection has been designed for sites that require an approach that respects and maintains the building’s original aesthetics. For listed buildings, for example, a folding guardrail means that workers using the roof can stay safe at height, without the risk of the rail becoming a blight on a particularly special building’s appearance. Our inclined guardrail offers a streamlined option which slopes away from the edge of the roof, so it is almost undetectable from street level. It has the added bonus of keeping roof users even further away from the roof edge, making it an even safer, without sacrificing the aesthetic appeal of the building for regular users. This product range is new or special order.